We’ve only had a few days that actually feel like fall around here, but that’s enough to have me craving new flavors (or maybe that’s just pregnancy—hard to tell). While I love a good green smoothie, I’ve been inspired to create more seasonal varieties lately. Though pumpkin may be fall’s reigning flavor, I’d say carrot cake—with its orange interior and layers of warming spices—can feel just as festive. Plus, if you’re going to attempt to turn a dessert into a healthy smoothie, a dessert whose star ingredient is a vegetable seems like the right place to start. 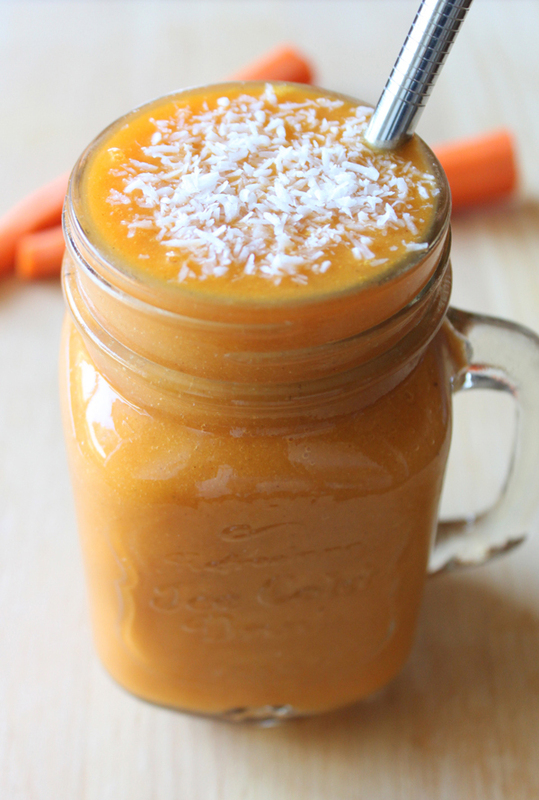 In addition to carrots, this smoothie contains pineapple, orange, and banana for necessary sweetness, cashew butter as a stand-in for cake batter, coconut oil and vanilla to serve as the hint of frosting throughout, and a mix of fresh ginger, cinnamon, nutmeg, and cloves for that signature carrot cake kick. That means you’ll get a whole lot of beta-carotene, vitamin C, and potassium, plus a healthy dose of good-for-you fats, from this tall glass of cake. I’ve been topping mine off with some shredded coconut to make it feel even more like dessert. Place all ingredients into a blender in the order listed (except for the coconut flakes) and blend until smooth. Pour into a glass and top with coconut flakes. 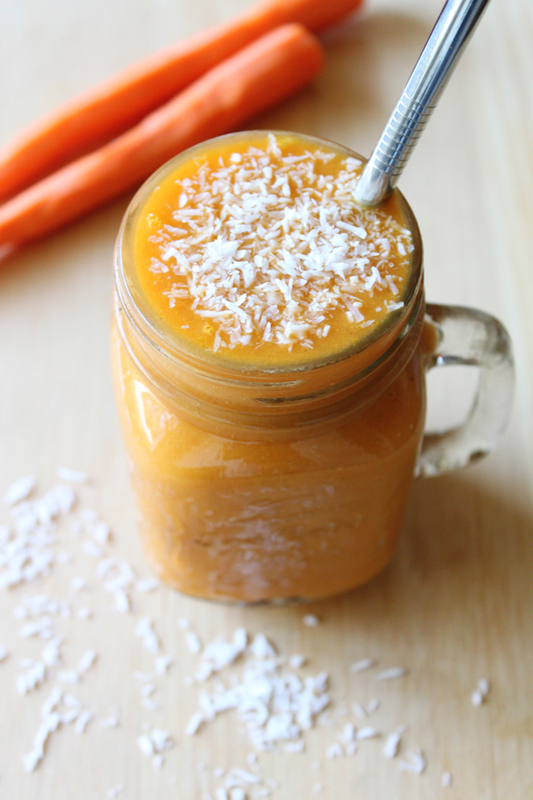 Note: Even if you’re not a carrot cake fan, you can still enjoy this smoothie. My husband is hugely opposed to cake with carrots but loved this combo. Plus, what could be more fitting for October than an orange-colored smoothie?